Here's the thing, though: in terms of the things that pitchers can control -- the things that are most easily repeatable and most predictive of future performance -- Smoltz was pretty excellent. His 7.43 K/9 and 2.03 BB/9 were both better than average for a starting pitcher. He'd conceded a lot of hits, yes, but mostly because 39% of the batted balls he conceded didn't find gloves (while the league-average rate is about 30%). And even though he'd allowed 1.80 HR/9 over those 40 innings, some of that was because his fly balls were leaving the park at a higher-than-normal rate -- 14.8%, as opposed to the league-average 11% or so. 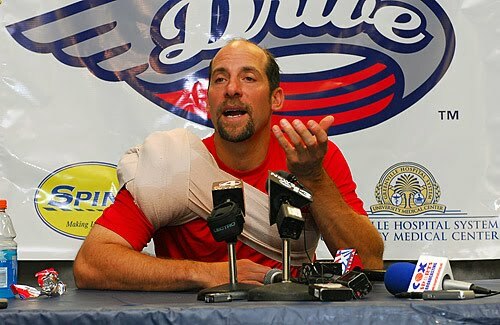 All told, Smoltz pitched like a pitcher who "should" have had a 4.19 ERA -- not vintage Smoltz, but certainly palatable. And definitely not a failure. When Dave Cameron made a very similar case on FanGraphs, the commentariat -- or, at least, much of the commentariat -- became rabid and emotionally unkempt. And once again you miss a big factor, Dave. Smoltz was missing bats and in the strike zone. He was also grooving a LOT of pitches. He was looking gassed by the 4th inning. He simply does not have the gas to start anymore. He probably could serve a purpose out of the pen, but Smoltz the first time through the lineup =/= Smoltz after. I’m as big a stathead as anyone, but this literally is one of those times where “the numbers don’t tell you everything.” John Smoltz has a great K/BB, but he just cannot pitch, especially to lefties. His slider doesn’t break, and his fastball is bordering on garbage. If he’s used as a ROOGY he’d be fine, but I’d be nervous if I were a Cards fan if he starts the rest of the way. I usually don’t say this about sites that deal with advanced statistics – but do you actually watch the games? Or do you just take a look at the box score? If you watched any of Smoltz’s innings from this year you’d see that he’s got a nice big fork sticking out of his back. One of the few poorly thought out articles I’ve read here. The basic message: for those people who watch the game -- even those who also respect the power of numbers -- it was clearclearclear that Smoltz was tired, old, and finished as a pitcher. This is certainly an appropriate place to note that the author of this piece is by no means averse to watching the game*, nor is he (read: I) averse to observations made by those with some expertise in football's Xs and Os. *Especially in such cases as when beer is in close proximity. However, I also know that, as our generous host Brian Burke reminded us in this week's Roundup post, we humans often see what we expect to see. Because Smoltz was a pitcher in his 40s coming off a major procedure, his troubles looked different -- even to intelligent people -- than did, say, Jered Weaver's, a young pitcher with very similar troubles. The strength of Smoltz's narrative obscured the fact that he was, most likely, just experiencing some seriously bad luck. The influence of narrative is very strong in football, too -- a fact borne out by the case of this year's Atlanta Falcons. Readers of this site will know that the Falcons aren't rated particularly well by the advanced metrics. Our Generous Host's regression model has them as a below-.500 team, actually. And yet, with a 13-3 record, the Falcons are being roundly praised. In this case, the narrative being constructed around the team concerns the expertise and preparation of the coaching staff. Even as he notes Atlanta's statistical shortcomings, Yahoo's Jason Cole praises head coach Mike Smith's "attention to the most minute details." Paul Johnson, writing for the Times' Fifth Down blog, cites the team's excellence both in penalty yards and turnover margin. "This speaks of discipline," he writes, "and that starts at the top." Certainly, it would be difficult for a team to win without an excellent coaching staff -- and it's even possible (although very unlikely) that Smith possesses some quality that has allowed him to excel in games decided by six points or fewer (in which situations, Cole notes, Smith is 13-7). But all this leads us to note the painfully obvious: if Smith is so very good, why is his team just okay in terms of passing and running? And just okay in terms of defending the pass and defending the run? Even those fans who're less inclined to give weight to the numbers -- they recognize that these are the things that football teams spend the majority of a game doing. Of course, anyone already convinced of the Falcons' excellence has a pretty easy response: "Scoreboard." That's fine, I suppose. And difficult to dispute. Again, it's possible that Mike Smith et al. have stumbled upon a little-known means to the great and glorious end of winning football games. But more likely is that the Falcons will regress to their Generic Winning Percentage. More likely is that a .460-team has won 13 of its last 16 games. More likely is that the Falcons will commence playing like such a team immediately. Given his credentials and desire to continue pitching, it was pretty clear that Smoltz would receive at least one offer to finish out the season -- and he did, like three days later, from the St. Louis Cardinals. So, how'd Smoltz perform with the Cards? Before I say how Smoltz pitched in St. Louis, it's essential to note that, because he threw only 38 innings with them -- i.e. roughly the same amount he threw with Boston -- it's actually not that important how Smoltz pitched with the Cardinals. It takes a long time for a pitcher's ERA to become a reliable indicator -- more than 200 innings. So even if he allowed exactly zero runs over that span, it wouldn't necessarily confirm that he (Smoltz) was "back." It would create a smaller window of Smoltz's probable "true talent," yes, but still nothing certain. Anyway, in the end, here was his line with St. Louis: 38.0 IP, 36 H, 18 ER, 4.26 ERA. As with Boston his strikeout and walk rates (9.47 and 2.13 per nine, respectively) were above average for a starting pitcher. Also as with Boston, Smoltz conceded hits on batted balls at an inflated rate, 33%. All told, he pitched in St. Louis like a pitcher who "should" have had a 3.46 ERA. In any case, it's not surprising that he ended up much closer to the 4.19-ERA pitcher he "should" have been with Boston than the 8.33-ERA pitcher he ended up being. The Green Bay Packers are the 2009 John Smoltz. Or, perhaps stated more accurately, the Atlanta Falcons are the anti-John Smoltz. The Smoltz Narrative was strong enough to cloud the judgment even of smart people. The Falcons narrative is similar: they're likely a mediocre team that's gotten very lucky. Atlanta's gonna win the SB and make me look like a fool! Brian, would it be any sort of consolation for me to say that you ALREADY look like a fool? The flaw in the stats logic on Smoltz (and others...Chad Qualls comes to mind) is that for BABIP to regress and ERA to get human, it assumes you can pitch at the major league level to begin with. My BABIP might be .980. It wasn't unreasonable at the time to assume a 41 year old getting hit around like a pinata was in fact, done. But Adam, the other aspects (the K/9 and B/9, etc) did speak to his not being done. At the extremes that's a definite possibility, Adam, but, even with the Sox, Smoltz (a) struck out 18% of the batters he faced, while only (b) walking or hitting just 7%, and (c) inducing grounders (i.e. the most desirable form of contact, generally speaking) on just under 43% of batted balls (roughly league average). Those are not things you or I could do. Nor are they things that a fringe major leaguer could do. Even John Wasdin -- who could match the 2009 Smoltz in zero of those categories -- had a .302 career BABIP-against. It would be much more surprising were Qualls to post an ERA above 5.00 in 2011 than below 4.00 (or 4.50 and 3.50, if you'd like to account for Petco Park). Again, like Smoltz, he did a number of things that good major league pitchers do. Oh. Or what Syh said. Sorry. I wasn't really disagreeing with the basic premise, just that it wasn't unreasonable to see Smoltz in those 8 starts with the ballooned ERA, everything dropping for hits, and knowing he's 41 and off an injury and saying he's done. I know the whole fallacy of "trusting your eyes", and that K/9 and BB/9 weren't bad. And also that its too small a sample size to make any definitive judgement anyway. I'm looking on Fangraphs now ( I do enjoy Carson's writing btw), I mean basically you can see he got killed on grounders that turned into hits. Were they particularly hard hit balls or just bad luck? Who knows. I did see a few of his starts, and I was surprised after the Sox canned him when I saw his peripherals were good. It truly didn't have that feel, And yes, I could easily qualify as a telepundit with that random and utterly anecdotal observation. Games like this one almost make you think that regression to the mean works like the gambler's fallacy; i.e. that the Falcons were "due" to turn the ball over a ton. Tarr - It was certainly satisfying to watch, even if it was probably too good to be true. Oh man, totally did not expect to ever be featured as an anti-statistic guy...haha. I still maintain that while Smoltz had something remaining, he simply was not getting it done the 2nd time through the lineup. Happened in each one of his starts. Maybe we did cut him too soon, but he did have a 4.95 FIP / 5.07 tERA in his time in Boston. While he also had poor luck, Red Sox fans certainly were not delusional in their immediate assessment of him. The educated Sox fan was saying basically what I said, it's not that Smoltz was a BAD pitcher, just that he was getting worked the 2nd time through the lineup. That being said, I was on board w/ you guys over the Falcons. Looks like I (as well as you) were right. Except one game doesn't prove we were right. We could have seen the same outcome if the Falcons were 99% to win. Nevertheless...they were way overrated, and the objectively better team won. I think the way GB dominated Atlanta once they got rolling, while obviously not "proving" anything (as using single data points as evidence of anything is statistically insane), does provide basis in the old "W-L record now is not a predictor of W-L record later" point. If a team is basically a coin flip to win a game (as the Falcons could be said to be, effectively an average team), it's unlikely, but totally plausible, that you'll get 13 heads/wins, about a 1.23% chance you'd achieve the mark or higher. The funny thing about GB-ATL is that the columnists are still writing as though ATL is a top team - talking about how Rodgers is proving he's an elite QB by beating the NFC #1 seed. But actually if this was a week 16 matchup, and both GB and ATL had records like their GWP (GB 10-4, ATL 6-8) they would be saying that Rodgers played well, but let's see how he does against the top teams. I'm not saying Rodgers isn't good, because I certainly wouldn't want my team facing team him (oh wait that already happened, I'm an Eagles fan), just that it's a little early to be crowning him after a strong game against a weak opponent. Yet more of this narrative-stuff the author points out. That´s what Brian´s model predicted all season long. 48-21!! It had to be a Blow-Out like this to silence all critics, and the Power-Rankings which are the same as the W-L Column. That´s also me me, several wekks ago. "ATL will exit the Play-Off´s after one game". I am not only proud of Brian, but me too. The Luck for ATL is over. Finally. Bold predicted. Good so. Worst ever 13-3 Team. Thank goodness the general public continued to ride the coat tails of W-L record for ATL though. Made (makes) winning wagers on teams like ATL a lot easier. Wish I would have had the same chance with SDG in the playoffs. Although then we would have had good team vs terrible coach = a big question for the playoffs. ... and now where are the 95+ comments (like in the Week 17-Advanced Rankings) ripping Brian? Where are all those ATL-Fans who turned a blind eye to reality? Where is Prisco (the Man who always fails)? If it was 20-17 ATL-Fans would have said they were better but unlucky. 48-21, that´s for all of us, the smart readers of this site. We can congratulate each other. Great game Green Bay, and an obvious win for the model. That said, thank you to those acknowledging that one game does not prove anything (would have italics on prove if I could). This game doesn't prove the Falcons were overrated, just like the regular season game didn't prove the Falcons are better than Green Bay (or as good as if you want to factor in the 3 points Vegas does). Of course the margin of victory doesn't speak well for the Falcons, but look at the win probability chart. The Falcons had a 65% chance of winning with 4:04 left in the first half. Then came two extremely costly turnovers while in position to score and the game got out of hand. Anyway, I'm certainly not going to win any arguments about the Falcons still being a really good football team right now, and unfortunately they won't have another chance to prove me right this year. Brian, great site. I'm glad trumpeting the case of the Falcons has given me reason to start frequenting it. I've enjoyed the debate, and I look forward to likely continuing it next year, as I (for one) expect the Falcons will probably continue to outperform the efficiency model by excelling in a few areas not reflected in the model. We'll see. Forgive me for probably missing the obvious, but who wrote this excellent article? Bigmouth, it's Carson Cistulli, of course! David-Agreed. One game proves nothing. I think that game said more about how good GB is than much about ATL. Thanks for the heads-up, James. I should have known -- I love Carson's stuff on Fangraphs. Brian, it might not be a bad idea to include the author's name with a link (e.g., to other posts).